Chief Master Sergeant Oren W. McClure enlisted in the United States Naval Reserve at the age of 17. He served in the Naval Reserve from March 1958 until August 1961 when he enlisted in the Untied States Air Force. Upon completion of basic training at Lackland AFB, Texas, Chief McClure was assigned to the Aircraft Control and Warning career field and was sent to Keesler AFB, Mississippi for technical training. Upon completion of his training he was assigned to the 623rd AC& W Squadron at YowDaki and Kumi Shima, Okinawa. Chief McClure returned to the CONUS and served in the 745th AC&W Sq, Duncanville, Texas and Perrin AFB, Texas. He was discharged from active duty 13 August 1965 and returned to his home state of Colorado where he joined the 138th AC&W Sq, Colorado Air National Guard as a full time employee. He served there until March 1968 and then transferred to the 147th Fighter Interceptor Group, Texas Air National Guard. Chief McClure was assigned to an administrative position until he became a Security Policeman in August 1968. He attended all levels of Professional Military Education in residence and excelled in each level to include being a distinguished graduate at the ANG NCO Academy. Chief McClure provided the leadership and expertise to the security police field resulting in the 147 SPS being named the ANG outstanding unit in 1991. During his tenure he provided guidance during many Presidential and other high level dignitaries visits to include those of approximately 30 heads of state. Chief McClure and his unit were recognized by the Secret Service and the State Department for their outstanding support and expertise in dignitary protection. 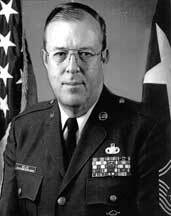 Chief McClure has served in numerous leadership positions in the Texas ANG to include being the chairman of the Texas Air National Guard Senior NCO Council. He also served as the first chairman of the Texas ANG Chiefs Council. He was appointed to the additional duty of Senior Enlisted Advisor to the 147th Fighter Group in 1987 and remained in that position until February 1995. Chief McClure worked on many security issues impacting the Air National Guard and was called upon in numerous cases to assist other units or to work an issue at the Air National Guard Readiness Center. He was selected by the Air National Guard to be their representative on the National Guard Bureau 1996 Summer Olympic Task Force. Chief McClure was promoted to his current grade 24 March 1978. He has been awarded the Meritorious Service Medal, Air Force Commendation Medal, Joint Service Achievement Medal and numerous state awards to include the National Guard Association of Texas Minuteman Award. Chief McClure retired effective 1 March 1997 after serving 38 years, 11 months and 22 days of dedicated service to his state and nation.